Nobody has to miss out on savory stuffing this season! Thankfully we will miss out on the fattening starches that usually make up stuffing but on none of the flavor. This delicious (S) bread stuffing is a wonderful side dish alone, or you can add meat such as cooked sausage or ground turkey to make this a complete meal. 1. Mix well and bake in greased 8×8 pan at 350 for 25 min. These will have a tendency to stick so you will want to grease the pan well or use parchment paper. 3. Spread cubes on a cookie sheet and bake again at 300 for 20 to 30 min or until slightly browned and crunchy like croutons. 4. This can be made up ahead of time and stored in an air tight container. Refrigerate or freeze for use with stuffing later. 1. Add all ingredients except mushroom and Trim Bouillon powder to a skillet on medium/high heat. 3. Add mushrooms and chicken bouillon powder. 5. Add 1 & 1/2 cups water and full recipe of bread cubes. Mix and pour into a 9×13 pan. 6. Bake at 350 for 25 min. Stir mixture half way through baking. 7. Serve with your holiday turkey or chicken. * The THM Baking Blend variation may produce a denser stuffing. * Add cooked sausage, ground turkey or other meat of choice before baking to make this a complete meal. * If not using the pre-made Trim Bouillon mix, you will want to add 1/2 teaspoon of each (salt, onion powder, thyme, and garlic powder). 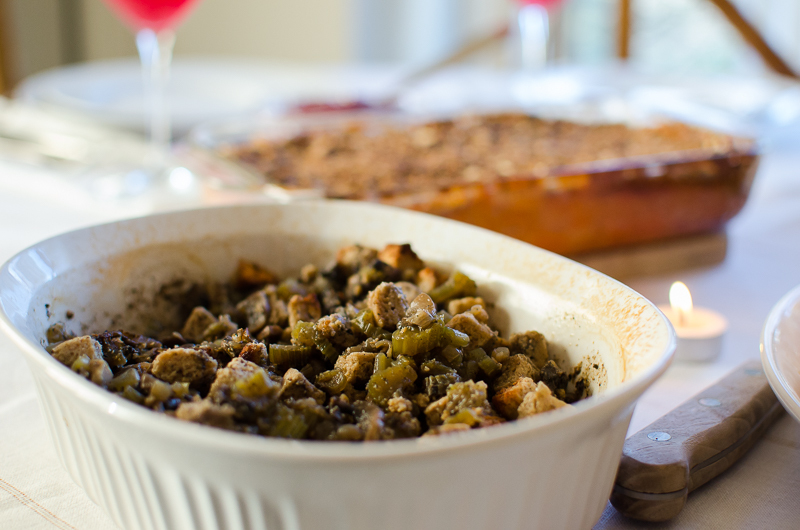 Click here to download the PDF of the Baking Blend Stuffing recipe! This recipe is chock full of super foods without the usual maltodextrin, MSG, and other unneeded additives in most bouillons. This recipe can help both Drive Thru Sues and Purists stay on-plan. You wonít regret spending the few minutes that it takes to make this up. It will help you make up a bowl of soup as tasty as grandmaís, without the time and effort. 1. Combine the ingredients and blend in a dry blender, food processor or coffee grinder to make sure all ingredients are blended and powdered. 2. You only need 2 to 3 tsp of the mix per 1 cup of boiling water to make a tasty broth or stock. We suggest starting at 2 tsp then adding a little more if you want a richer flavor. Click here to download the PDF of the Bouillon recipe!